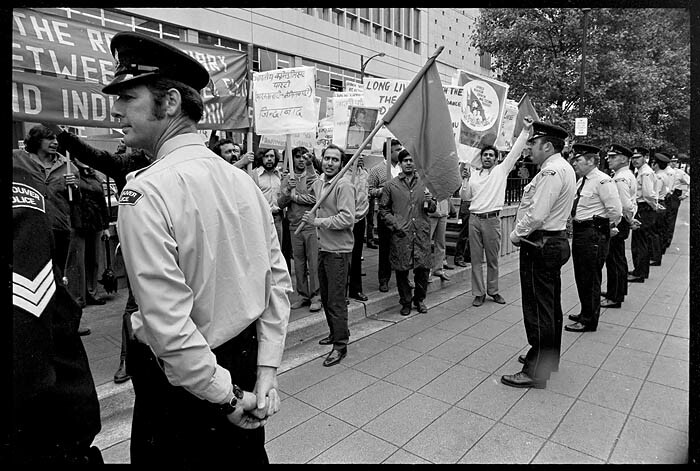 January 19th, 1974 — Pickets protesting at the Burrard Hotel in Vancouver. 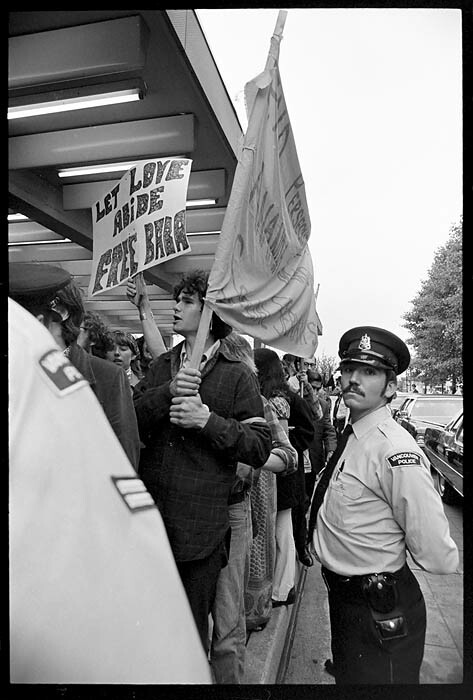 I have no idea what this story is about except for what’s said on the picket signs but the words do make this an amusing protest even for Vancouver. The picture is what was called in the old days, the days of film, developer, and darkrooms, a “roll end”. Roll ends were the first or last picture on a roll of film often of the photographer’s feet taken as he was advancing the film after loading a new roll or less often a half frame at the end of a roll that didn’t quite make it to 36. This particular frame is the first on a roll of pictures taken at a fire on Broadway. It has no connection with the fire and is just an indication of the endless variety in the daily life of a newspaper photographer. 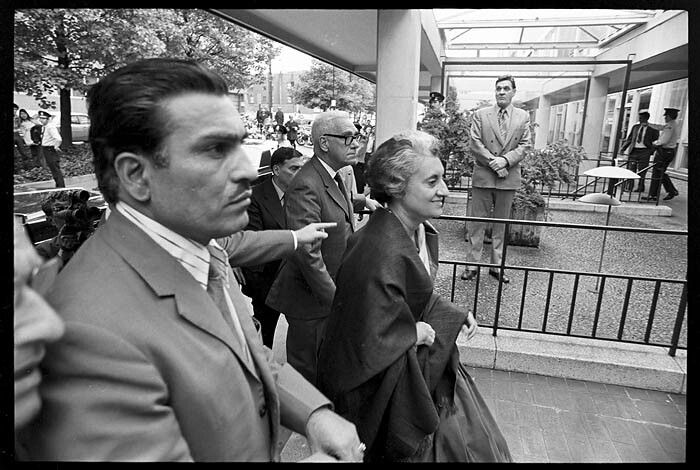 June 23rd, 1973 — Fourty one years ago today Indira Gandhi came to Vancouver. There was a protest but considering the dislike so many had for the Indian president it all seemed so low key and subdued. 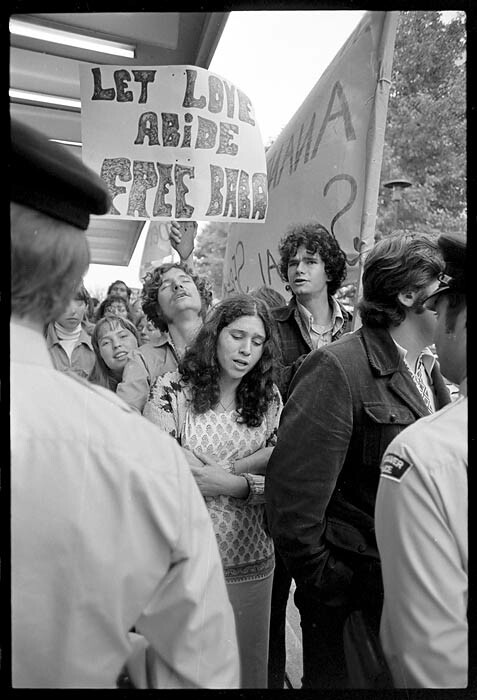 October 14th, 1976 — It was a day of protest against the provincial government. 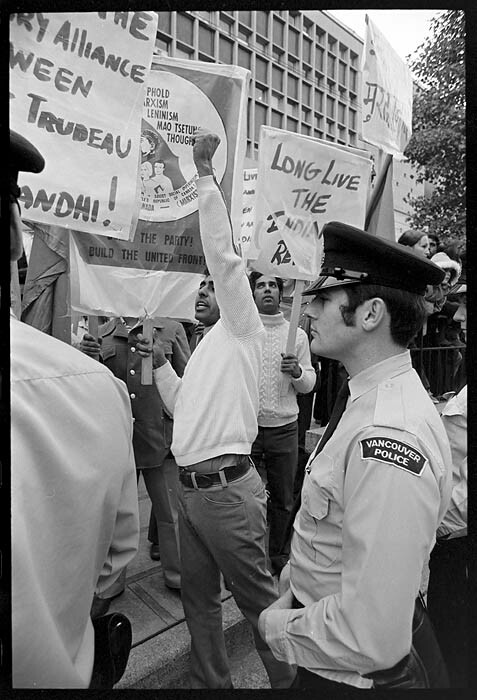 Every union member walked out and marched through the streets of downtown Vancouver blocking traffic, closing businesses, all of it culminating with a rally at Empire Stadium. Most of the pictures from that day showed crowds of marchers with banners. At some point, of course, it had to end and everyone went home. That’s when I saw this man walking across an unusually empty Georgia Street, the protest over, on his way home. Jan 13th, 1979 — Anita Bryant was a speaker at the Orpheum Theatre soon after becoming a crusader against homosexual lifestyles. There was a protest outside on Granville Street and people attending the speech had to walk through it. The protest was peacefull but on the way to the assignment I had a feeling there would be a moment so I stayed lang after the rest of media had left. My reward was this woman walking through the crowd holding her nose. It’s not as good as Weegee’s “The critic” but it’s my best imitation. January 24th, 1985 — High school students, probably from Templeton Secondary School, driving from school to school in the east end of Vancouver during a class walkout protesting government cutbacks to the education system in Vancouver. It’s one of many prints that were saved from a discard box in the darkroom of the Province newspaper.